The DI data shows that in all three countries women give more importance to religion than men. 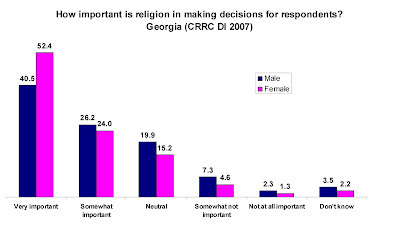 However, in Georgia the difference between genders is not as significant when it comes to religion as in Armenia and Azerbaijan. As an illustration, on the question “how important is religion in making decisions?” 53% of women and only 39% of men in Armenia attribute somewhat important or very important role to religion. In Georgia, 76% of all female respondents and 67% of male respondents give religion a central role in their life. A similar pattern can be observed with praying. More female respondents say they pray more than once a week (some of which daily) than male: 44% female vs. 24.6% male in Armenia and 52% female vs. 25.6% male in Georgia. The situation is different in Azerbaijan, where slightly more male respondents report praying once a week (including those who pray daily): 16.4% male vs. 15.2% female. This, however, can probably be explained by the religious traditions embedded in Islam. The World Values Survey (2000) also asked religion related questions to respondents in over 80 countries. Their data shows that women of Christian faith across the world are more religious than men. The picture is different in Muslim countries. Thus, similarly to Azerbaijan, in Turkey around 61% of male respondents attend religious services once or more than once a week in comparison to 7% of female. Check out DI datasets if you are interested in exploring this issue further.